NerdWallet pinpoints the average American credit card debt at just over $15,300. With additional charges accruing on this debt daily, cards carrying an 18% annual percentage rate (APR) are racking up $2,630 in interest per year. Since the minimum payment is only slightly above the interest charges added to the balance each month, consumers are finding themselves stuck with credit card statements that barely budge. A quality balance transfer credit card can help you quickly pay down debt by reducing the amount of interest that is tacked on to the total amount owed. Obtaining a temporary reprieve from interest charges buys you some time to focus on paying down the principle, which helps you get out of debt sooner. The best credit cards for balance transfers offer interest-free promotional financing, huge sign-up bonuses and generous rewards. The most generous program available as of September 2016 includes a 0% introductory APR for 21 months, but you will need an Excellent FICO Score to qualify. By switching to a card that offers a 0% APR for 18 months, a consumer who owes $8,000 on a credit card that charges a 20% APR saves $2,445 during the promotional period if they are paying $275 per month. Most programs assess a fee on the total amount transferred, but it is usually substantially smaller than the amount you would pay for the interest. In the above scenario, you would be charged $240 based on a 3% transaction fee, which still provides an overall savings of $2,205. Additionally, the minimum monthly payment drops by $93, freeing up your cash flow to apply to other living expenses. However, if you are able to continue paying the full $275 each month, you can pay off your balance in 31 months instead of 41 months, saving almost $2,445 in interest. Paying off as much of the balance as possible during the promotional period allows you to leverage the possible maximum savings. Increasing your monthly payments to $457 for a period of 18 months nets a larger savings of $2,796. There is a vast variety in credit terms and conditions for balance transfers, so you must carefully analyze the differences before settling on a program. While the right choice can put you on the path to becoming debt free, the wrong choice can put you in an even worse financial position than your original situation. In order to get the most out of your new card, you must set a realistic plan that considers your ability to pay off — or at least significantly reduce — the debt by the time the promotional period ends. Balance transfer fees can be steep, stacking hundreds of dollars on top of your debt. You will want to evaluate whether the long-term savings outweigh the upfront costs. Make sure you are aware of the annual fee. Some creditors are willing to waive this fee for new members during the first year upon request. The standard APR that is charged once the promotional period expires is based on your creditworthiness. This is always a variable rate that can increase or decrease based on your payment history, credit utilization ratio and credit score. Most credit cards have a standard variable APR between 13.24% and 23.24%. A penalty APR, which often reaches 29%, usually kicks in if you are late on just one payment. You not only lose your fantastic promo rate but also end up paying more than your original rate. Any balance that remains after the promotional period expires is subject to the standard APR. Some cards charge you the full interest on the entire transferred amount if the balance is not paid off completely. Minimum payments are applied to the lowest APR balances on your account, which is likely the transferred balance. Since new purchases and balance transfers accrue monthly charges based on the standard APR, you can rack up a tremendous amount of fees if you are taking advantage of a long-term promotional offer. Any amount above the minimum payment is credited to the higher-rate balance. Most offers require that the balance being transferred comes from a different creditor. Depending on the card, balance transfer programs are only offered to customers who are opening new accounts. Loyal customers who have accounts in good standing can also qualify for balance transfers, but debt with the same company is usually not transferable. The most favorable programs require applicants to have Good to Excellent credit scores in the range of 690-850. Even if you fall within these parameters, you might be denied if the lender views you as a bill-shuffler for making too many balance transfers. Creditors believe that a high number of transfers for the same amount shows that you have a problem paying your bills, which decreases your creditworthiness. Balance transfers are subject to credit approval because you are usually opening a new account and the new lender is claiming ownership of your balance by paying off the current creditor. A credit inquiry shows your payment history and ability to honor the agreement. Applying for a new credit line will temporarily affect your credit score since it requires the lender to submit a hard inquiry to the credit bureaus. You can expect a five-point drop for each inquiry. While it is tempting to transfer the maximum amount allowed to leverage the benefits of the promotional rate, be careful about overextending your credit utilization ratio above 30% since this can hurt your score. 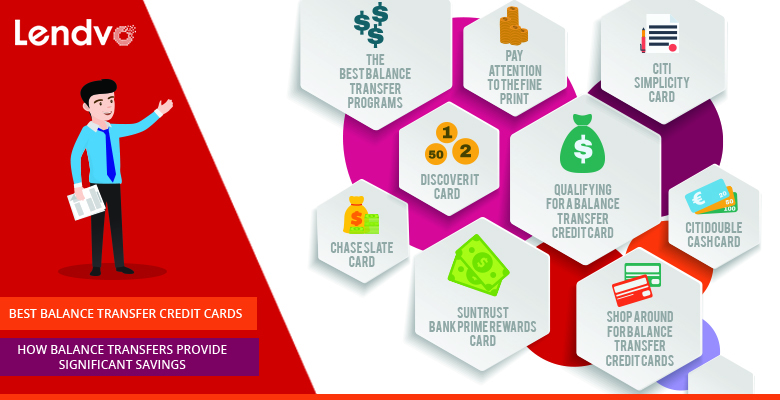 After analyzing dozens of credit card terms, Lendovo has discovered that there are currently several quality balance transfer programs available on the market as of September 2016. Many of these promotions are set to expire by the end of the year, so now is a great time to explore options for transferring your debt to another lender who provides more favorable terms. Compare these six deals to find which one best fits your needs. The Citi Simplicity Card tops our list for offering the best balance transfer benefits. New card members with an Excellent credit rating are extended one of the industry’s longest promotional periods at 21 months of interest-free payments. This 0% APR introductory offer also applies to new purchases during the first 21 months. You must request the balance transfer within the first four months of opening the new account. Unlike most programs, you can shift over student and auto loans as well as other lines of credit, but current Citi account balances are ineligible for a transfer. The account is assessed a 3% transaction fee with a minimum charge of $5. Balance transfer payments take at least 14 days to process after the account is opened. After the promotion expires, Citibank customers pay a standard variable APR of 13.24% to 23.24%, which is applied to unpaid balance transfers, new balance transfers and new purchases. The Citi Simplicity Card offers excellent perks for the life of the account, including no annual fee and free access to your Equifax FICO Score. You get to choose your preferred due date, and since late payments are waived, you will never pay a fee or have a steep penalty rate kick in. However, missed payments are still reported to the credit bureaus. Equipped with EMV Chip Technology, the card gives you access to worldwide car rental insurance and extends the manufacturer’s warranty on major purchases. For 60 days after making a purchase, the Citi Price Rewind program actively combs through hundreds of online merchants looking for a lower price. If one is found, then your card is refunded the difference. The Citi Private Pass provides special access to entertainment events, including pre-sale concert tickets, VIP packages to sporting events, exclusive dining experiences and complimentary movie screenings. CDiscover allows you to transfer credit lines and various types of loans for a 3% transaction fee. Requests are processed within 7 days. The first late fee is waived, and a tardy payment won’t result in a higher penalty APR. Accounts are never charged an annual fee, overlimit fee or foreign transaction fee. The Discover it Card carries a lower variable APR of 11.24% to 23.24%. While you are saving money paying off your debt interest free, you can make money too by doubling your cash back during the first year. This lucrative sign-up bonus pays 5% cash back on up to $1,500 in new purchases each quarter that fall into specific categories, such as home improvement stores, restaurants, movie theaters and gasoline. You could score big savings this holiday season by shopping with your Discover it Card at department stores, Sam’s Club and Amazon.com. Purchases made outside the quarterly rotating categories earn an unlimited 1% cash back. Additionally, at the end of your first year as a card holder, you receive a full Cashback Match on all your earnings. The cash back programs let you earn hundreds of dollars on your purchases, but be aware that this separate balance is charged the standard interest rate. Since this balance sits unpaid until the transfer is satisfied, you will also be racking up significant interest fees. The program also requires you to login online every three months to opt in to the new bonus categories. You can redeem your cash back at any time in any amount or use it instantly at Amazon.com checkout. Although the rewards never expire, the credit is applied to your account if it is closed or has been inactive for 18 months. The Discover card is less widely accepted in the U.S. than VISA or MasterCard, but you still have access to more than 9.6 million merchants nationwide. You are also provided with a free monthly update of your FICO Score from TransUnion. The Discover it Card has amassed 24,300 reviews by card members with an average rating of 4.8 out of 5 stars. It is easy to see how the Chase Slate Card has been chosen the past three years as Money Magazine’s top pick for Best Credit Card for Balance Transfers. With a long-running 0% APR for 15 months on balance transfers and purchases, it is one of the few cards that does not charge a transfer transaction fee and only requires an Average credit score to qualify. The Chase Slate Card was specifically designed to help you pay off credit card debt. Although you can only transfer credit card debt from lines outside of Chase, current Chase card members may apply. The transfer amount is capped at $15,000, and requests must be made within 60 days of opening a new account or the balance will carry a 5% interest rate. Payments to the original lender are processed 10 days after the new card is mailed to you. While you will still have a late payment fee between $15 and $37, Chase does not charge a penalty APR if your payment does not arrive on time. The standard variable APR ranges from 13.24% to 23.24%. As long as you are a card holder, you have access to your free FICO Score from Experian and a credit dashboard that explains the factors influencing your score. Chase also lets you set your due date and offers a program that helps you customize your debt payoff plan, all for no annual fee. Citibank gets another entry on our best of list with its Citi Double Cash Card. New accounts are eligible for an 18-month balance transfer offer with a 0% APR. You will need good credit to qualify for this no annual fee card, but there are less stringent requirements than other top-tier balance transfer credit cards. Citibank lets you transfer most types of debt for a 3% transaction fee up to your approved credit limit. Payments to the original creditors are processed within 14 days after the account is opened. While the balance transfer terms are generous, the real benefits of this card kick in when you begin using it to make purchases. The cash-back structure lets you earn 1% rewards on every purchase and an additional 1% bonus on your payments. Best of all, there is no cap on how much you can earn. Rewards are redeemable after you reach $25 in the form of a check, gift card or balance credit. You forfeit any accrued bonus after 12 months of inactivity, so make sure that you submit requests in a timely manner. Outside of the promotional offer, the variable APR on standard purchases falls between 13.24% and 23.24%. Although the first late payment of $35 is waived, the penalty APR jumps up to a variable 29.99%, which stays in effect indefinitely. Citi Double Cash Card holders receive the same great benefits available to Simplicity Card accounts, including EMV Chip Technology, car rental insurance, extended manufacturer warranties, the Price Rewind program and exclusive Private Pass entertainment deals. The QuicksilverOne Card offers a shorter introductory rate of 0% for just nine months on balance transfers and purchases, but customers with Fair credit scores have a greater chance of receiving approval. You also have the entire nine months to make the transfer. Accounts are eligible for a credit line increase after making the first five monthly payments. Note that there is a separate Quicksilver Rewards Card that doesn’t charge an annual fee, has higher cash back bonuses and requires an Excellent credit score. To entice you to add purchases that generate fees at a 23.24% variable APR, the QuicksilverOne Card carries offers unlimited 1.25% cash back on every purchase. New account members are also rewarded with a one-time $100 cash bonus if you charge $500 during the first three months. Nicknamed the “ultimate heavyweight cash back card,” the earned bonuses never expire and are redeemable in any amount. Uber riders get a $15 credit on their 10th trip when they use the Quicksilver card to pay for transportation through March 31, 2017. Capital One card holders have access to additional warranty protection, auto rental insurance, travel accident insurance and 24/7 roadside assistance at no charge. The price protection program ensures that you pay the lowest price on purchases for 60 days. The entire point of shopping around for the best balance transfer credit card is to dig yourself out of debt. Since you do not accumulate monthly charges during the interest-free promotion period, you are able to focus on paying off the principle. You will miss a valuable opportunity that may not come around again if you do not have a specific plan to repay the loan. Be careful of falling into the trap of taking advantage of the lucrative cash back offers on purchases before you pay off the transferred balance so that you are not racking up a whole new set of interest charges. Additionally, pay close attention to the fine print, particularly the annual fees, transaction fees and penalty rates that might kick in if you are ever late on a payment. For more help with financing options, check out Lendovo’s Resource Center where you’ll find thoughtful advice on loans, working capital and deal financials.